Sugar Tip Hibiscus - Hibiscus syriacus. Family: Malvaceae (Hibis-cus: ancient Greek and Latin name, syri-acus: Syrian). The Only Variegated Hibiscus with DOUBLE Blooms! The flower show begins in midsummer and doesn't end till mid-fall! Plant Patent Applied For. 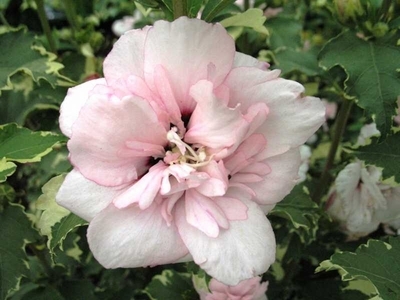 How's this for nonstop color from spring through fall Every leaf of this delightful new Rose of Sharon is splashed with creamy white (beginning pale yellow in spring and lightening as the sun grows more intense in summer) around the edges, giving the plant its name of Sugar Tip . A bit more formal in appearance than other Hibiscus, it makes a fine specimen, windbreak, tall foundation plant, and more. But when midsummer arrives and the gorgeous double blooms begin opening, the show really kicks into high gear! These flowers are as lovely and many-petaled as Roses, boasting a pale lilac-influenced shade of pearly-pink that adds a cooling note to the blazing summer garden. Sugar Tip is sterile, so instead of putting out a few blooms and then making seed, it spends all its energy setting new buds. The result is MONTHS of nonstop blooms lasting all the way through early fall in most climates and even later in areas where frost comes late or not at all. Like most Hibiscus, Sugar Tip is eager to grow and absolutely determined to bloom, no matter what the weather does. Very tolerant of heat and humidity, it puts up with any well-drained soil, and appreciates plenty of water for the best bloom show. The plant you will recieve is growing in a 2 1/4" pot.